By the end of this winter, my hands were chapped, wrinkled, and covered with small cracks. I’ve had dry skin before, but never like this. To blame: the extremely cold temperatures of this past winter, the dry air of a house heated by woodstove, and the hundreds of daily handwashings required by being home with four young children all day. It got so bad that when I took my daughter to the doctor for a checkup, the pediatrician stopped examining her when she saw my hands. “Whoa,” she winced, “what happened to your hands?” She then advised me to ask my doctor about prescribing a steroid cream. I ignored her advice until early April, when the temperature finally rose above freezing but my hands were as bad as ever. I’d started secretly comparing my hands to those of everyone I knew who did manual labor – farmers, contractors, large-animal vets. My hands always won. I almost laughed aloud. 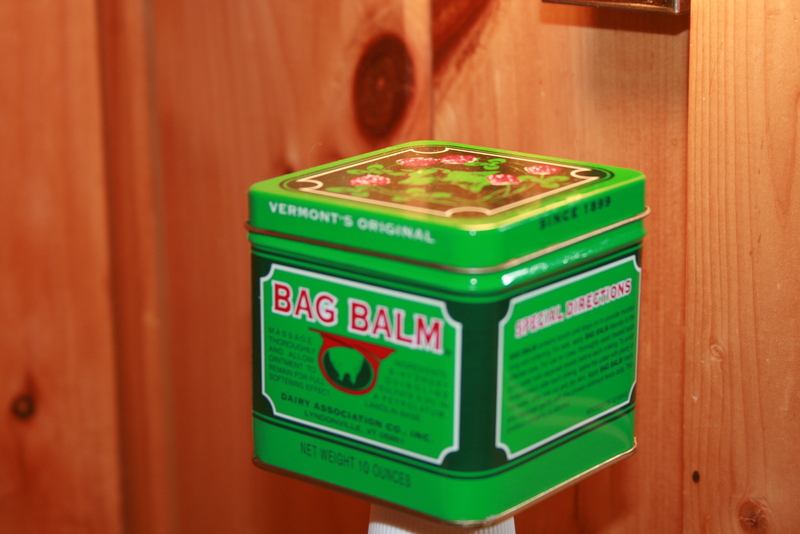 A few months earlier, I’d read Beach Conger’s memoir, Bag Balm and Duct Tape: Tales of a Vermont Doctor, in which he jokes about Vermont dairy farmers’ practice of treating all ills with – you guessed it – Bag Balm and Duct Tape. And here was my doctor, advising Bag Balm over a prescription. A little background for the uninitiated: Bag Balm is a salve originally created to soften cow udders. The beautiful green-and-red tin in which it comes proclaims Bag Balm “the farmer’s friend helping keep dairy cows from becoming chapped from the harsh Vermont environment.” As such, it’s officially intended for use only on animals, but legend has it that the dairy farmers’ wives noticed how smooth their husbands’ hands became after using Bag Balm on the cows, so it’s now commonly used to soothe chapped human skin as well. Bag Balm has a long and illustrious history. John L. Norris bought the formula from a Vermont druggist in 1899, and Bag Balm has been manufactured by the Dairy Association Company in Lyndonville, Vermont, ever since. Bag Balm was included in the provisions on Admiral Byrd’s 1937 trip to the North Pole, was used to soothe the paws of rescue dogs searching through the rubble of the 9/11 attacks, and was sent to the U.S. troops serving in Iraq and Afghanistan. I’m not receiving anything from Bag Balm for this endorsement (although I wouldn’t turn down another tin or two). I’m just telling the truth: it’s a quirky Vermont-made product that wasn’t on my radar screen, and then it was, and two days after I started using it the cracks on my hands had healed and the skin had softened. They still aren’t perfect, but in just two days, Bag Balm took a couple of decades off of my hands. More importantly, I no longer feel like I have a thousand papercuts. Just what IS Bag Balm, anyway? Well, according to the green-and-red tin, it’s 8-hydroxyquinoline sulfate 0.3% in a petroleum jelly USP and lanolin base. In layman’s terms: it’s Vaseline mixed with an antiseptic. Fancy Vaseline. So, my husband feels vindicated. Then again, he’s switched from Vaseline to Bag Balm.